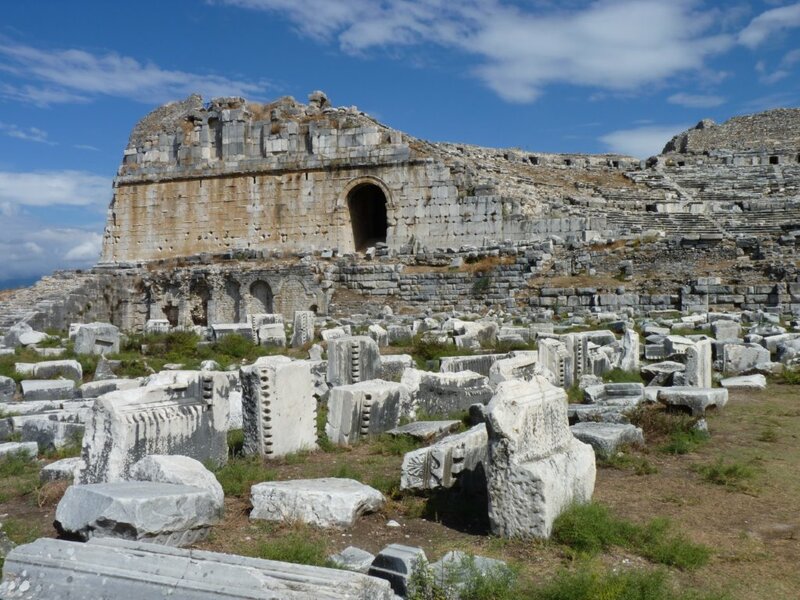 Once a harbor city, the ruins of ancient Miletus are now 10 kilometers inland from the beautiful Turkish shoreline; an excellent location for cruising on a crewed yacht charter. Silting from the River Meander gradually pushed the ruins of this ancient city inland along with the neighboring ancient cities of Didyma and Priene. 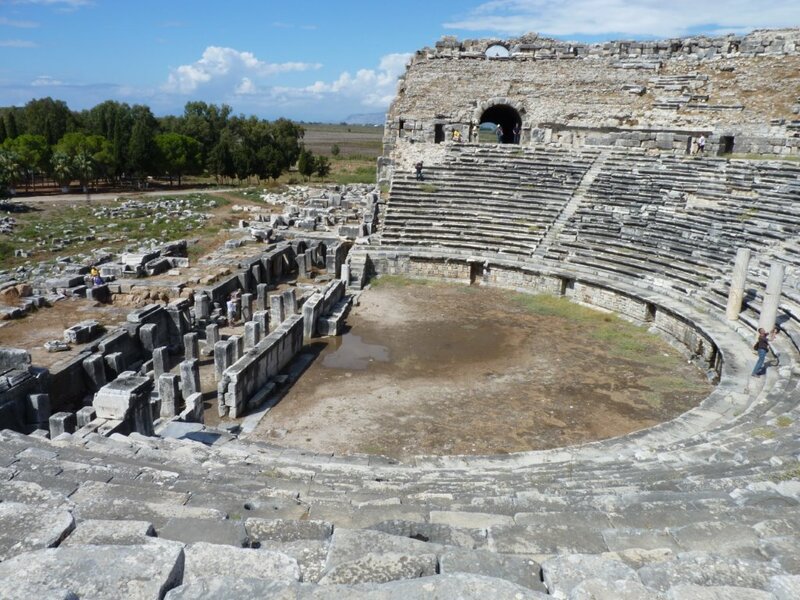 Once one of the 12 important Ionian cities; today, Miletus is an important archeological site, and one that is easily visited while on a crewed yacht charter along the western coast of Turkey. 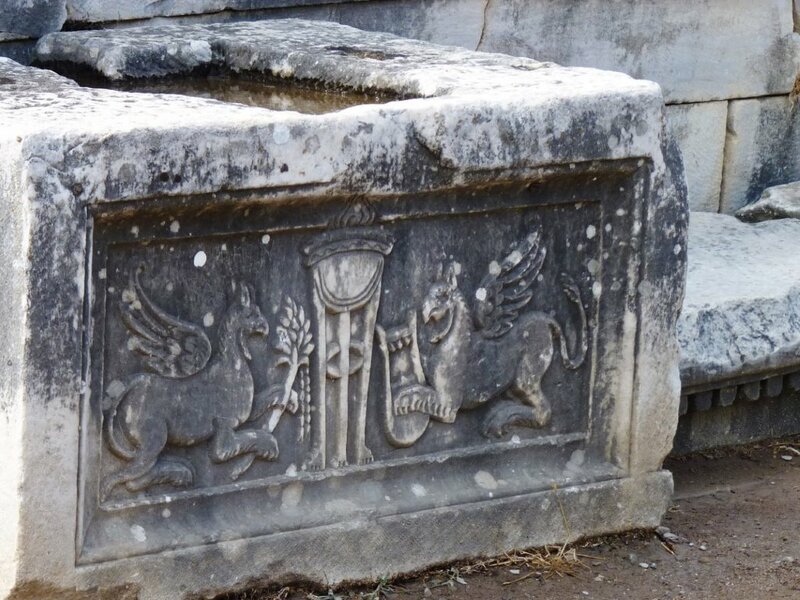 While there is archeological evidence that civilizations lived in the area of Miletus from the Neolithic through the Bronze Age, early artifacts are being found primarily from the Minoan Civilization. These artifacts probably first arrived in Miletus through trade as early as 1900 BC, followed; according to legends from Ancient History, by the Cretans themselves as the first significant settlers of the area. In later years as one of the 12 important Ionian Cities, this city was a powerful city with a large and busy harbor and was an important center of philosophy and science. This city first came under Persian rule and then Greek rule and finally Roman rule as did many of the neighboring cities and towns. 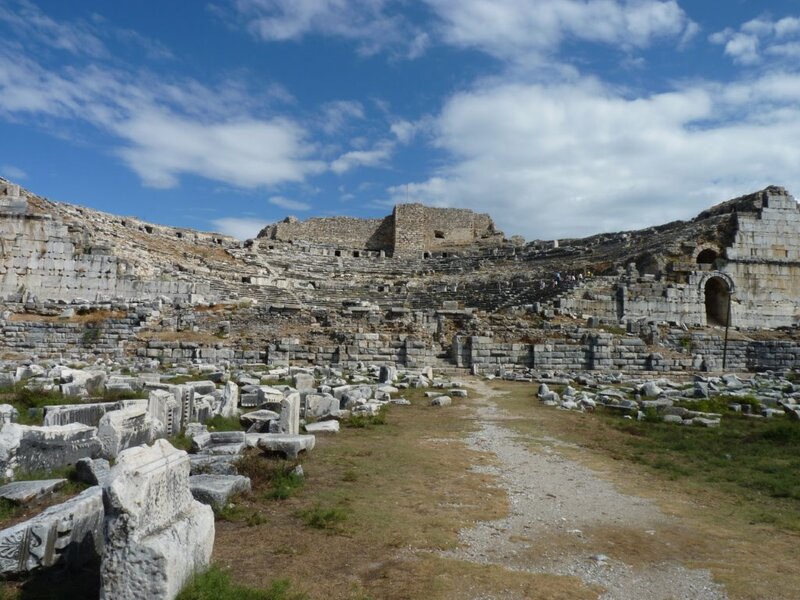 During Roman rule, the Sacred Way was built between Miletus and the Temple of Apollo in Didyma; which was a 12 kilometer roadway for Pilgrims to walk in reverence to the Temple of Apollo to see the famous Oracle. 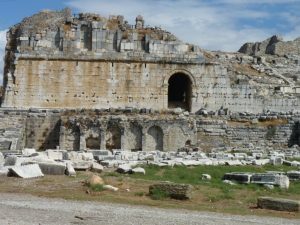 Towards the end of Roman rule as Christianity flourished, the Apostle Paul is said to have visited Miletus several times. During Byzantine times, this town was an important home for Archbishops and eventually fell under Seljuk Turkish rule and then Ottoman rule until the city was abandoned as being too far inland, and a haven for malaria, in the 17th century. Presided over by the ruins of a Byzantine castle, today the ancient ruins sit in a broad plain just inland of the silted area of the Meander River. Just under the castle ruins are the ruins of a large amphitheater that once could seat 25,000 people. Near the theatre are the ruins of the extensive Baths of Faustina, a large complex once filled with water fountains. 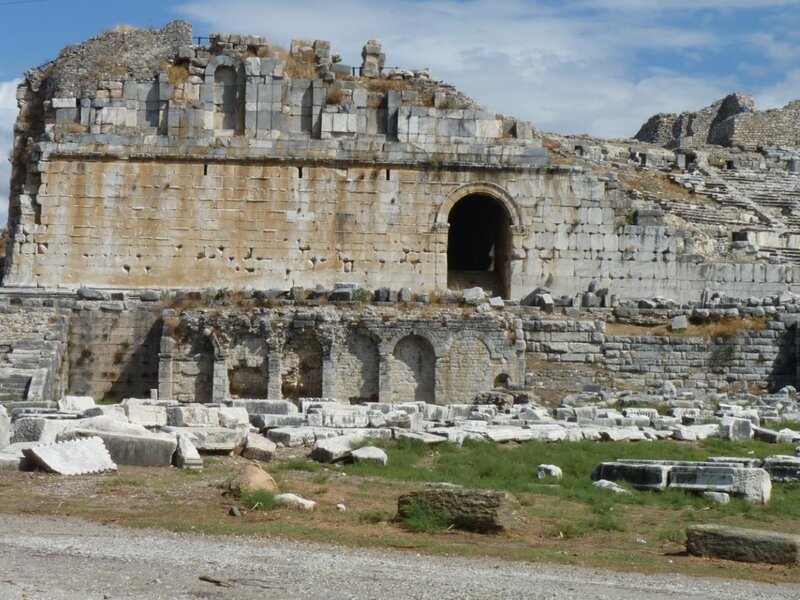 Near the Baths once was the Harbor Gateway that separated one part of the harbor from the city and was the gate that led to the Sacred Way between Miletus and Didyma. 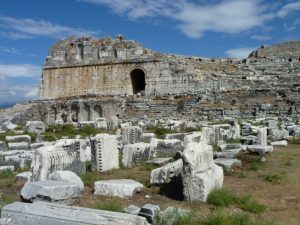 Other ruins of this once large city, still being excavated, include numerous temples, an agora, the Roman Baths, Byzantine churches, a synagogue, stadium, and the Harbor Monument, which was said to stand 25 feet high, topped with a tripod and cauldron. Legend says that this Harbor Monument was the location where the Apostle Paul met with local Christians. Close by the ruins is a small museum housing numerous artifacts from the excavations. 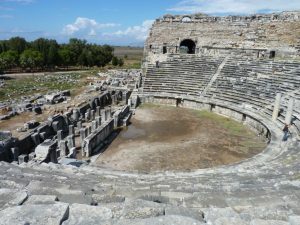 Stop close by in the modern harbor of Didim to visit the ruins of the once very powerful city of Miletus, birthplace of many well-known figures in the ancient world, while on a crewed yacht charter along the southern coast of Turkey.